In order to plan to seize business opportunities and sidestep potential threats, you start by conducting a SWOT (strengths, weaknesses, opportunities, threats) analysis. 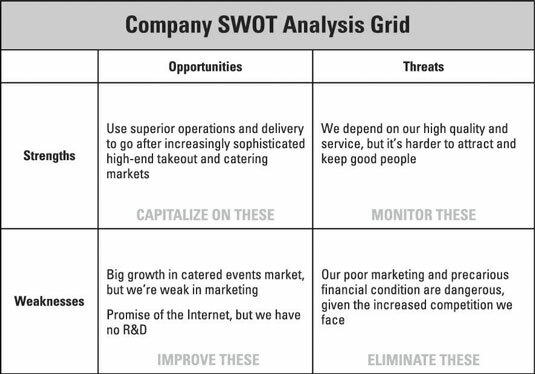 A SWOT analysis helps you analyze your company’s capabilities against the realities of your business environment so you can direct your business toward areas where your capabilities are strong and your opportunities are great. List your company’s strengths and weaknesses and its opportunities and threats. Use your lists as you make decisions that contribute to your business plan. Develop strategies and actions for capitalizing on opportunities and create plans for addressing threats and weaknesses that could threaten the future of your business. This shows how the owners of the Soup’s On catering business completed the grid for their company. Based on the outcome of the caterers’ SWOT analysis, they made some significant business decisions: They hired a marketing consultant with experience developing restaurant chains; they conducted research to get a sense of the resources required to achieve competitive Internet presence; they strengthened their management structure to prepare for growth; and they recruited two investors to improve their company’s financial condition. As a result, Soup’s On is ready to grow into a small chain. The owners expect increased competition for catering and takeout services, but they project that growing demand will support a number of catering companies. What’s more, they’re confident that by focusing on quality, consistency, and sophisticated menus, they can compete successfully. By investing time upfront to understand their strengths and weaknesses, the caterers increased their chances of success. Revisit your SWOT analysis on a regular basis — at least annually and more frequently if your business is facing major changes in marketplace or competitive conditions, experiencing growth problems, or failing to meet goals and objectives — to see how the balance of strengths, weaknesses, opportunities, and threats may have shifted. Your business environment is constantly in flux, so you want to be sure that your business plan reflects the world around you as it is, not the way it was.